Václav Havel, the former Czech president and dissident playwright, who wove theater into politics to peacefully bring down communism in Czechoslovakia and become a hero of the epic struggle that ended the Cold War, has died at 75. His assistant Sabina Dancecova says Václav Havel died Sunday morning at his weekend house in the northern Czech Republic. As president, Václav Havel oversaw the country’s bumpy transition to democracy and a free-market economy, as well its peaceful 1993 breakup into the Czech Republic and Slovakia. 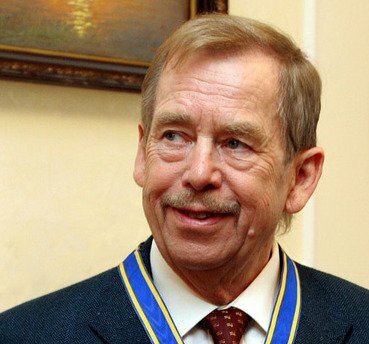 One of the leading intellectual figures and moral forces in Eastern Europe, Václav Havel was elected President of the Czech and Slovak Federal Republic in 1989 and in 1993 President of the newly formed Czech Republic. Václav Havel’s role as a public figure has now somewhat overshadowed his record as a dramatist and political essayist. His work often dealt with the power of language to interfere with clear thought. Václav Havel was born into a well-to-do family in Prague. His father owned Prague’s cliff-top Barrandov suburb and his mother, Bozena Havlova, the daughter of an ambassador and journalist, encouraged her son’s intellectual and artistic ambitions. Václav Havel supported the Prague Spring reform movement of 1968, though he did not play a major role. After it was crushed by Soviet-led Warsaw Pact forces in August, Václav Havel took on a more visible role in activism. During the 1970s and 1980’s Václav Havel was repeatedly arrested, serving several years in prison for his dissident activities (1977, 1978-79, 1979-83, 1989). After the communist regime sentenced Václav Havel in 1979 to 4 1/2 years in prison for subversion, he was given the opportunity to emigrate, but he chose imprisonment. In the 1980s Václav Havel became the undisputed unofficial leader of the Czechoslovak human rights movement. In November 1989 he formed a new opposition group, Civic Forum, but it was students, who began the “Velvet Revolution.” Following the fall of communism, Alexander Dubcek (1921-1992), who had launched a series of reforms in 1968 and was subsequently expelled from the Presidium, was elected chairman of the parliament. Václav Havel was elected in 1989 by direct popular vote President of the Czech and Slovak Federal Republic, following Gustav Husák.